A temp to perm job is a job that starts out as a temporary job but turns into a permanent position. The employee could be hired with the possibility of a temporary assignment turning into a permanent job. Or, at some point during the assignment, the company may decide they would like the employee to stay on and offers him or her a permanent position. Temp to perm is an option to consider when you are job searching. Even though most job seekers would prefer a permanent position right off the bat, a temporary job is a way to help pay the bills and could lead to permanent employment with the company you're temping at. Temp jobs can be an excellent foot in the door for job seekers, particularly when the job market is very competitive. In a competitive job market, there are far more people looking for jobs than there are available positions. It makes companies that are hiring have an advantage. They can be more picky about who they hire. 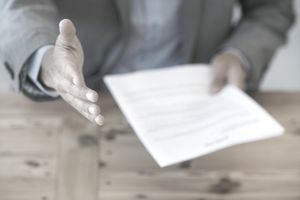 Temp to perm positions allows companies to "try before they buy," testing out an employee's abilities before making a formal offer with benefits. While an interview, references, and a resume can provide a good sense of a candidate's work abilities, nothing beats observing an employee on the job for knowing if they are a good fit for a company. Often, temp employees are hired through a temp agency. For companies, that means the burden of interviewing and making hiring decisions is reduced. Instead of sorting through hundreds of resumes, they will only review a handful from the temp agency's pre-screened candidates. Sometimes a temp job is temporary because the need for the position is short-term or seasonal. For instance, many retail jobs hire heavily during the busy holiday season, but no longer need as many employees once January returns and exchanges are complete. It can be hard for employers to know if a potential candidate is a good fit for the company. But the reverse is true as well: Often it can be hard to tell if a job is right for you. Temp-to-perm positions allow you to get insight into the responsibilities involved in a position. Temp jobs are a great way to learn new skills. From using cash register systems to discovering new phone techniques, even a short-lived spot can provide much training. When you're not sure what you want to do next, a temp job can be a good way to explore a potential new career path. For employers, since the position is temporary, there may be a greater willingness to take on a candidate without much direct experience. Even if you only work a temp position for a few months, you will probably learn a lot, and be able to expand the skills section on your resume, as well as adding new jobs. During a holiday season stint at a retail store, you'll learn to use the cash register, help customers (even difficult ones), and track inventory. The top five areas employers typically hire for seasonal help include retail (33%), customer service (31%), administrative and clerical support (17%), shipping and delivery (12%), and hospitality (10%). "Seasonal work can be a valuable opportunity for job seekers to not only gain new skills and experience but to also land full-time permanent positions," said Brent Rasmussen, President of CareerBuilder North America. "Job seekers looking for seasonal work should prepare their resumes and look into open positions sooner rather than later, as a significant number of employers start hiring for seasonal positions in October." Apply early: 45 percent of employers said they're not accepting applications for seasonal jobs after October. 80 percent are not accepting applications beyond November. Show that you’re excited about the opportunity: A lack of enthusiasm is the number one pet peeve of seasonal hiring managers as indicated by 59 percent of respondents. Don’t say you want the job for the discount: Employee discounts are a great perk especially during the holiday season, but 31 percent of hiring managers said they are turned off by workers who appear to want the deal more than the opportunity. Get to know the company before the interview: 30 percent of seasonal hiring managers said they were deterred from hiring a candidate because that person had little knowledge of the company or its products. Follow the dress code: If you are interviewing for a job in a retail clothing store, it's a good idea to show up dressed in an outfit from that store. For 15 percent of hiring managers, wearing a competitor's ensemble deterred them from hiring a potential candidate. Follow company culture: Some companies have a work through lunch culture, while others support employees gathering in the kitchen for group lunches. Follow the culture of the company you're at, in terms of hours, socializing, meeting behavior, etc. Be responsible: Think of your temp time as an audition. Show up on time, avoid leaving early or taking excessive days off, and in general, be a dependable employee. Do good work: As well as showing up when you're supposed to, be the best possible employee for the position. Define in your head what would be good work, whether it's filing all papers by the end of the day, upselling sweaters, or serving customers with consistent good cheer, and then always provide it. Go the extra mile: Volunteer for extra work and help out others when they are behind in projects or need a hand. Your enthusiasm and commitment to the position will do wonders at helping employers know that you're the right candidate for a long-term, permanent position. Network: As well as being the best worker, it's also important to be a known worker. Doing a good job discretely may not be enough to get you noticed and hired on full time. Make an effort to interact with co-workers, to showcase your work, and to ensure that those with hiring power are aware of your value as an employee. And of course, it's important to make your desire for the permanent position possible: Set up a time to meet with your manager and state that you'd like to work full-time. Ask for feedback on your work, and establish a timeline for a decision if possible. During this conversation, you'll want to avoid being pushy, while still making your intentions clear. What Are the Top 10 Jobs in the LGBTQ Community?